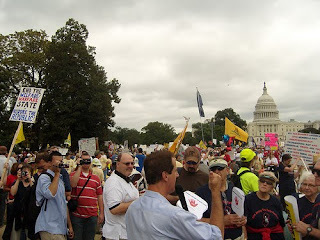 Above is a photo showing people from all over the country who came to Saturday's Tea Party held on the Washington DC Mall. Just like the August Town Hall meetings this Tea Party was not exclusively for the FairTax but it was well represented by FairTax supporters including dozens from NJ who made the bus trip to Washington starting @ 5:30 AM Saturday. Although the crowd was hard to estimate we know that 10,000 people on the Mall would look like a dot - there are some photos that show the Mall covered from end to end meaning that there were hundreds of thousands of people participating. As pointed out in our last message your line in the sand against a complete high jacking of your way of life is being defended only by people like this who have attended Tea Parties & Town Hall meetings in a tremendous grassroots movement all over the country for the past six weeks. The majority of the Republican party politicians in Congress have offered no resistance to BO's Democrat party lurch toward Socialism that has started in earnest with universal healthcare - BO's #1 agenda item. Now FNC gave extended coverage of the Tea Party starting with Saturday afternoon's live coverage. Their coverage also continued Saturday night & into Sunday. If you have learned more from this message & the posting on the ReturntoExcellence.Net blog about this event that was held to protect your best interest (& your children's & grandchildren's) you would be wise to realize that your source of information does not have your best interest @ heart. Accordingly why would you want to support an obvious hostile anti-American media that wants to filter news to you that benefits everyone but you? Find another source of information that deserves your trust. The stakes could hardly be higher & the only people you can really rely on could not be working harder @ Tea Parties & Town Hall meetings.